BATs believe that systemic racism continues to be a problem in America and that we must work together to end it. We need to acknowledge that it is a problem in order to move towards that end, and we need to call it out when we see it. BATs believe that we need to use a variety of tactics to end racism. We believe that sometimes civil disobedience and disruption are necessary. BATs believe that #BlackLivesMatter. PERIOD! And that includes Black Voices. It is not White America’s place to control how the movement manifests itself. 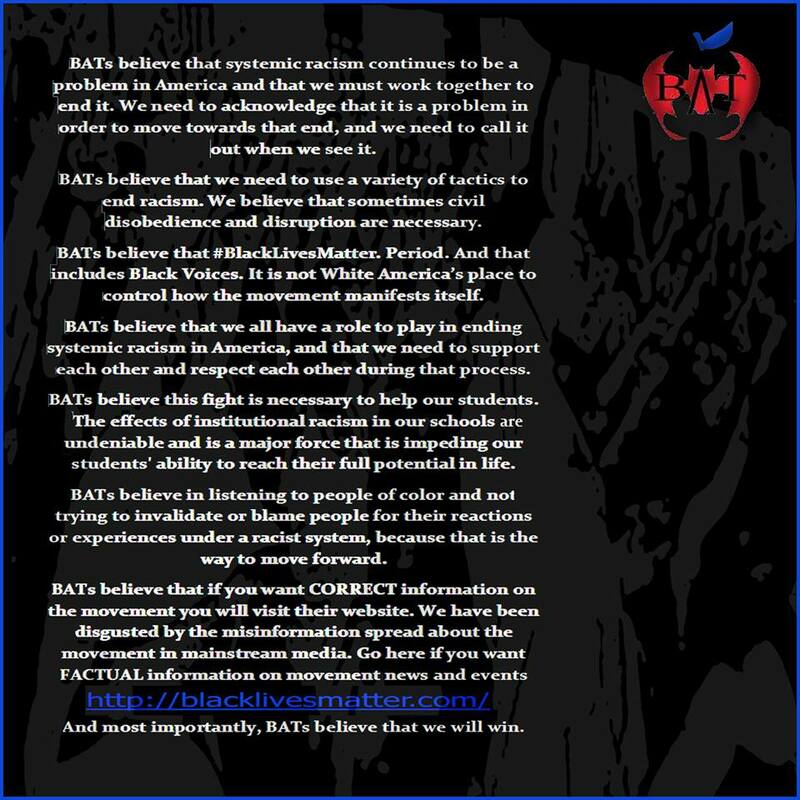 BATs believe that we all have a role to play in ending systemic racism in America, and that we need to support each other and respect each other during that process. 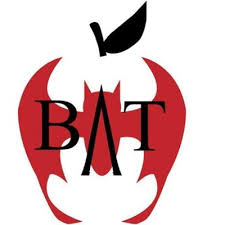 BATs believe this fight is necessary to help our students. The effects of institutional racism in our schools is undeniable and is a major force that is impeding our students' ability to reach their full potential in life. BATs believe in LISTENING to people of color and not trying to invalidate or blame people for their reactions or experiences under a racist system, because that is the way to move forward. And most importantly, BATs believe that we will win. Having just viewed again the movie "Conrack" with Jon Voight, I am struck by the similarities between current educational policies in many states, including my own Indiana, and the racist views enforced by the white elitists in the film. Educators and true administrators should stand up as Pat Conroy did even at the risk of their jobs to defend students' rights to learn from creative teachers instead of being labeled "lazy" or "failing" by biased testing scores. Time to take back our schools! Jeb Bush blamed teachers and teacher unions for social justice and racial justice problems yesterday. My kids chased him out of the forum chanting Black Lives Matter after he refused to answer specific questions from black women. Also Bush gave out misinformation about immigration and told one activist he should wait 100 years or a century to see his family. If you do not believe that racial issues are directly linked to everything happening in public schools - you need to wake up.